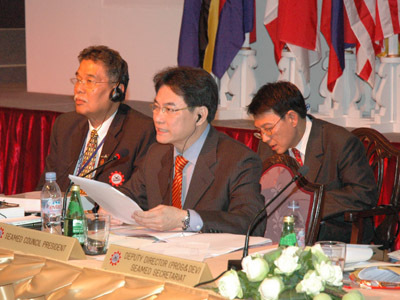 The Southeast Asian Ministers of Education Organization (SEAMEO) Council made significant decisions that did not only mark a milestone in its history, but also guaranteed stronger cooperation in education to truly provide Education for All in the region during its 44th Annual Conference hosted by Thailand on 5-8 April 2009 at the Sheraton Grande Laguna Hotel, Phuket, Thailand. The SEAMEO Council, the Organization’s governing body that is composed of the 11 Education Ministers of Southeast Asia, approved the establishment of three new SEAMEO Regional Centres that are based in Indonesia and will cater the professional training needs in language, math and science of more teachers in the region and beyond. The centres will be called Quality Improvement of Teachers and Education Personnel (QITEP) Centre for Science, for Mathematics and for Language. Moreover, the Council directed the implementation of 10 collaborative projects for the unreached groups in Southeast Asia, and the piloting of the use of mother tongue as bridge language of instruction in certain parts of Indonesia. Deputy Prime Minister of Thailand Mr Korbsak Sabhavasu presided over the opening ceremony of the conference and emphasized the need to realize the commitment to provide quality education to everyone which is the key to the future of Thailand and the region as well. At the start of the conference, the 43rd SEAMEO Council President and Minister of Education of Malaysia Dato’ Seri Hishammudin Tun Hussein, reported the accomplishments of the past year. He stressed that with the present challenges, such as the worldwide economic crisis that the SEAMEO family faces, there is no other choice but to work together. On the other hand, the newly-elected President of the 44th SEAMEO Council, Minister of Education of Thailand Mr Jurin Laksanawisit, expressed gratitude to the outgoing Council President for his dedication during his term. He emphasized that the Council, through the conference, would determine future direction of the organization. As an important part of the four-day meeting, the Ministry of Education of Thailand led a Policy Forum which highlighted the role of teachers and the need for their professional development in order to remain competitive in the fast-changing world. The Philippines, Singapore, Indonesia, Malaysia and Vietnam gave presentations on the different strands of the professional development for teachers. The Education Ministers and other participants visited the Satree Phuket School and Phuket Vocational College to observe the teaching and learning processes in these Thai institutions of learning. 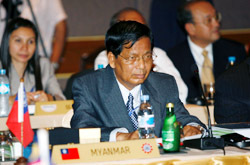 Participants to the 44th SEAMEO Council Conference totalled to 173 that comprised the 11 Ministers of Education of Brunei Darussalam, Cambodia, Indonesia, Lao Peoples Democratic Republic, Malaysia, Myanmar, the Philippines, Singapore, Thailand, Timor-Leste and Vietnam; and their delegations. 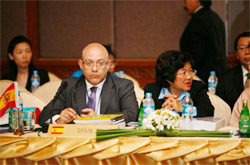 Also present at the conference were representatives from the SEAMEO Associate Member Countries, namely: Australia, Canada, New Zealand and Spain; the ICDE which is an Affiliate Member; the ASEAN Secretariat; and international organizations, namely: UNESCO, UNICEF, World Bank and SIL International. Directors and senior officials from the 15 Specialist SEAMEO Regional Centres attended the meeting as well. 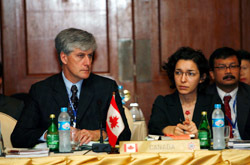 The SEAMEO Council Conference is an annual meeting of the Education Ministers from the 11 SEAMEO Member Countries. 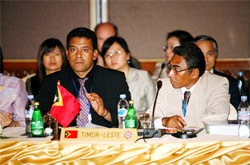 The conference serves as a forum for discussion of policy and regional initiatives, setting directions for programmes and projects of SEAMEO and its Units, and review of programmes and activities of the organization. 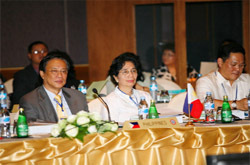 The 4th ASEAN Education Ministers Meeting was held concurrently with the conference. 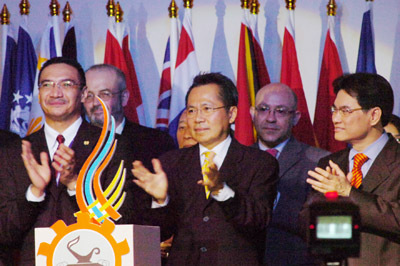 The 45th SEAMEO Council Conference will be held on January 25-30, 2010 in Cebu City, Philippines. Deputy Prime Minister of Thailand Mr Korbsak Sabhavasu declares the 44th SEAMEO Council Conference open. 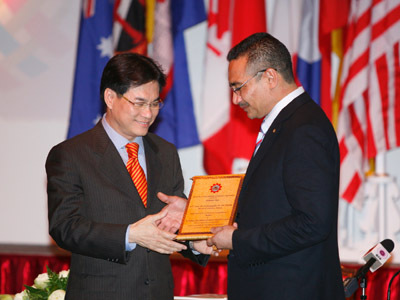 The new SEAMEO Council President and Minister of Education of Thailand, Mr Jurin Laksanawisit presents a testimonial plaque to the outgoing President, Dato’ Seri Hishammuddin Tun Hussein, Minister of Education of Malaysia. The President of the 44th SEAMEO Council and Minister of Education of Thailand, Mr Jurin Laksanawisit presides over the Council’s Meeting. SEAMEO Secretariat Director Dato’ Dr Ahamad bin Sipon assists. 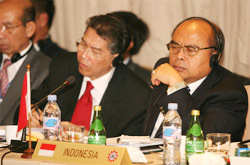 Education Ministers from Southeast Asian countries; and representatives from Associate Member Countries and Affiliate Member and partner international organizations participate in the conference.